For the second consecutive year the 2014 Subaru BRZ sports car has been voted the carsales People’s Choice Best Performance Car Under $100,000. With all the attention the new 2015 Subaru WRX has been getting, the 2014 BRZ has taken back seat to the performance sedan. But the BRZ is wildly popular around the globe and has just been voted the carsales People’s Choice Best Performance Car Under $100,000 award. The two-door coupe has won the award in conjunction with the Toyota GT 86 that was developed by the two companies last year. Both cars are produced by Subaru at their Gunma factory near Tokyo, and since it’s launch in July 2012, the rear-drive BRZ sports car has been selling well and been popular with driving enthusiasts around the world. The people have spoken again and voted the 2014 BRZ the People’s Choice again for the second straight year. The award in Australia gives the online audience for the carsales network of automotive websites the chance to choose the most popular vehicles across 13 key categories. The list of potential People’s Choice cars was compiled by a group of automotive journalists and key contributors to motoring.com.au, carsales.com.au, CarPoint.com.au and redbook.com.au. The team is familiar with all makes and models of cars and has driven hundreds each year and chose what they believe are the best of the crop. The press release says in many cases the cars that made the list were based on multiple drives of several variants of each car in each category. The cars are also chosen based on Redbooks data including price, size, passenger capacity and other category specific factors. Subaru and Toyota designed the sports coupe to be a drivers car and they succeeded in a big way. It starts with rear-wheel-drive configuration. All true sports cars will have rear-drive for optimal performance. It also includes a rigid, lightweight body and powerful brakes assisted by control-enhancing technology. It also gets new high-tech upgrades for 2014. This allows BRZ to quickly shave off velocity while precisely setting up a perfect line in the corners. It features vented disc brakes, electronic brake-force distribution, and it’s lightweight-2,762 lbs. The Subaru Boxer engine sits low in the chassis for great weight and balance distribution. It continues with awards Best of 2013 – cars.com (USA), Best Buy for 2012 - Australian automotive website themotorreport.com.au, Best Sports Car of 2013, from the Canadian Autos.ca website, BRZ engine – winner, 2013 Ward’s 10 “Best Engines”, U.S., 2013 Sports Car of the Year by Canadian website Auto123.com, 2012-2013 Japan Car of the Year “Special Award”, and 2012 Sports Car of the Year in French car magazine, Echappement. 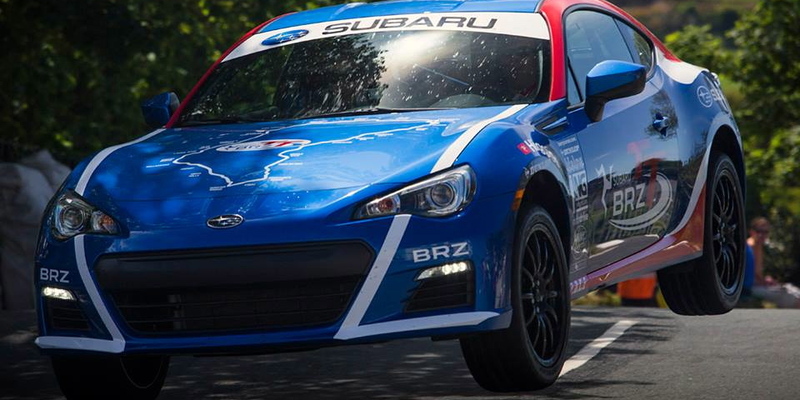 For the second straight year, the BRZ is the People’s Choice. With a starting price of $26,390 here in the U.S., it’s no wonder the 2014 Subaru BRZ is a favorite choice and is winning all these global awards.